It's not a secret that I make alot of ice cream, all from scratch, and always with the intention of trying to create something new, fun and interesting. 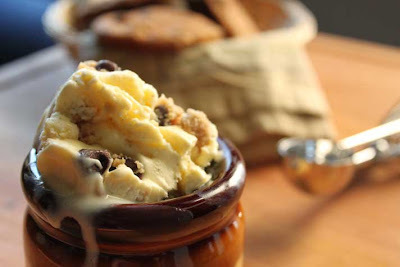 So when Dave asked me to make cookie dough ice cream, I was relatively uninterested in this request. It seemed so plain and .... usual. But I can't say no to Dave. 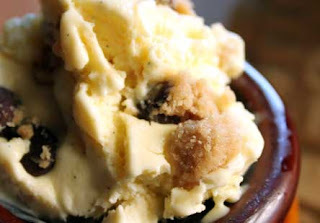 This cookie dough ice cream was absolutely fabulous. I was completely blown over by the flavor, completely unexpected. The dough was just the classic Nestle cookie dough recipe - Dave helped by following the exact instructions on the back of the bag. The ice cream itself is one of the heaviest custards I've made- but it's needed to stand up to the raw dough. Don't skimp on the using the vanilla bean, it really does make a difference in the flavor. You could use any dough that you want, but the classic chocolate chip dough is really quite amazing. Enjoy this, make it for you and not the kids and try not to eat it all in one sitting! Cookie dough- we used 1/2 of the batch of the Nestle recipe, and then made the rest into cookies. Warm the cream, half and half and the vanilla bean over medium heat. Whisk the egg yolks with the sugar until they are pale and fluffy. Temper the yolks with the warm cream, add everything back into the pan along with a pinch of salt, and cook until it thickens and coats the back of a spoon. Stir often and be careful not to scorch the bottom. Cool the custard in a ice bath, place in the fridge overnight if you have time. Place the custard in the ice cream maker and continue according to the manufacturers directions. 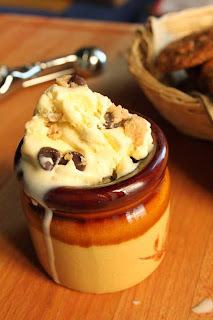 Add teaspoons of the cookie dough to the custard as it churns and freezes. Enjoy!